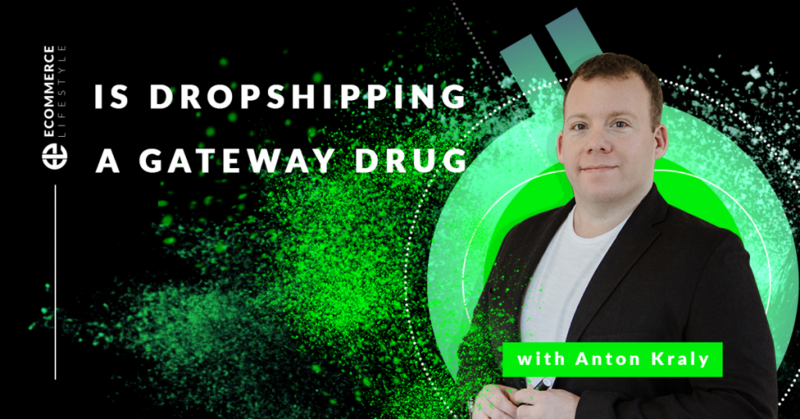 I recently met up with a friend who was at the first DSL retreat and we talked about how drop shipping can be like a gateway drug. Here is a link to his YouTube page. Many skills you learn while drop shipping can be used in so many other entrepreneurial ventures. Do not just have a special offer on your site...have an expiration date on that offer! Have an estimated arrival date for when potential customers can expect to receive their item. During the podcast I referenced a prior eCL podcast....It was called Usability vs. Design. Yo, what's up everybody? Anton Kraly here from ECommerceLifestyle.com, and welcome to another episode of The E-Commerce Lifestyle Podcast. So I just wanted to hop on quick for today and talk about something that just came up during another podcast I did where I was a guest. So the podcast that I was just on is from Riley over at Livin' That Life. I'm honestly not sure if there's a website for that. I know that he has his podcast and his YouTube channel and his audience over there where he talks about traveling really all over at this point, Asia and Europe, so if you're on ECommerceLifestyle.com and you're listening to this podcast there, I will link up his YouTube channel below. You should definitely go check it out if you're into traveling and location independence. Again, I'll link that below this on ECommerceLifestyle.com. and what we talked about was really his journey so far and how E-Commerce has evolved since 2014. And the reason we talked about it since 2014 is because Riley actually came out to our first ever Drop Ship Lifestyle retreat, and that was in Chiang Mai in northern Thailand. We had about 100 people fly out from all around the world. We spent three days hanging out, learning, just doing fun things, exploring Chiang Mai, and that's where I got to know him, and that's where he basically said he started his whole location independent journey. And what was cool is he basically said he considers himself and a lot of the friends that he made out there the Chiang Mai Class of 2014, because again, they all came out for the retreat, a whole bunch of people stayed, which is awesome, and since then, a lot of friendships have just remained, right? But what's cool and the reason I wanted to name this episode Is Drop Shipping a Gateway Drug? is because a lot of them are not running drop ship stores anymore. Some of them built them, some of them sold them, some of them still have their stores, some of them are running their stores in addition to something else, but what's cool is drop shipping and Drop Ship Lifestyle is the thing that brought them into this reality. This place where they can connect, where they can focus on building their businesses, and where they can actually develop a different set of skillsets, right? Like an alternative education. So I wanted to talk about some of the things we spoke about in regards to E-Commerce and some things that you should do on your product pages with Shopify, but I also wanted to talk about this whole, is drop shipping a gateway drug thing, and some of the skills that translate into whatever you want to do. Again, think of this as a hands-on education, which by the way, if you're not part of Drop Ship Lifestyle yet, just go to DropShipLifestyle.com/webinar. Again, DropShipLifestyle.com/webinar, and you can see what I'm talking about here, how this business works. But some of the skillsets that you develop while building out your first store, one of them is how to actually create relationships and how to build relationships because a big part of it is contacting suppliers. Picking up the phone, reaching out, introducing yourself, getting on the phone with the right person, being able to interact with them in a way that they approve you to sell their stuff. So just having to do that, having to build those relationships is huge, regardless of what direction you eventually go. Whether it's selling on Amazon, or importing, or making info products, or making content, or writing, or whatever business you get into, that's a great skillset to have because regardless of what you're doing, you're going to have to get good at making these relationships with people that you don't know. So awesome skillet that translated into that whole class of 2014. Another skillset could just be hosting events and retreats. I know we have somebody that was at our first retreat that does all different types of events themselves now, and not saying that I teach people how to do that or that's what they learned, but they were able to see an event come together from nothing to our first ever retreat and make connections that they can then leverage in having their own events all around the world. Another obvious skillset regardless of what business you eventually get into or what you do as a side project is selling online and being able to build an online store, being able to make a website that can actually have transactions come through it. Again, whether you're eventually selling coaching services or whatever, that's a skillset you'll develop when you build your first drop shipping store. Of course, running paid ads. Most of our sales come from us paying companies like Google and Facebook to send us qualified leads. And this is going to be true, again, based on whatever you decide to eventually do. If you have the skillset that you'll learn from drop shipping, you can translate that into almost any business. That's why this really does seem like a gateway drug of business. Some other things. Talking to customers. You're going to have a business, you're going to talk to customers. No matter what you do, you'll need that skillset. Why not refine it while making money from your drop shipping store? And of course all the financial stuff like creating and looking at your profit and loss statements, how to file business taxes, how to write off expenses and actually have as many good ones as you can to lower your income and pay less tax, all skills that come from drop shipping that really, again, can take you on whatever path you eventually want to get on. So instead of having to figure things out with no starting point, you could be making money as you learn all of these things. It's really a win-win. And again, you decide. Once you know this all, what do you do? Do you scale your store? Do you sell your store? Do you open another one? You could do whatever you want. So I just thought that was a cool conversation, and when he posts that podcast, I'm going to go ahead and I'll share it. So depending on when you're listening to this on ECommerceLifestyle.com, I may or may not have the link to the recording I did with him, but again, as soon as I have it, I'll update this post on ECommerceLifestyle.com if you want to check out the full conversation. So other things that I want to share, though, that we talked about were what we do on our product pages on Shopify to increase our conversions. Now, some of these will apply if you're drop shipping and running a physical brand only, but a lot of them, again, you're learning how to convert, right? You're learning how to get people to choose you, so this will apply to any type of business you build. Honestly, if it's offline or online, a lot of these you'll be able to work into your business regardless. So let me share some of these tips with you. The first thing that I recommended for doing on your Shopify product page to increase your conversion rate is having some kind of urgency. So what I recommend is using expiring coupon codes. So have an offer, maybe it's for free shipping, maybe it's for saving five percent, whatever it is. But don't just have that special offer on your website, have it expire at a specific date and time so people will take action sooner than later. I also recommend having an estimated arrival date. On your product page, not only should the customer be able to see if the item is in stock, but they should see estimated arrival date so they know when to expect to get it. This is very important now because you can thank Amazon, so many people shop there. When they're buying, they know when that item is getting to their house and they're not going to come to a random website and think, "Well, when am I going to get this thing? Is it next week? Is it in two days? Is it in a month?" The more specific you can be the better, the higher your conversion rate will go up. And honestly, a lot of back and forth with customers is them asking, "When is my item going to arrive?" So if you set it in advance by having it on your website, questions don't come up, they know when to expect it, everybody is happy. A few other things that I talked about that I can actually link to another podcast I did that goes deeper into this, but having your website optimized on the product pages so that the customer or the visitor doesn't have to leave. So having things like tabbed product pages. Tabbed, so T-A-B-B-E-D, meaning they don't have to click away from your product page to get more info. So having information like your shipping policy, your return policy, is there a warranty for the product? If you can get that all on the product page, then you have a better chance of keeping your customer there and having them buy from you over someone else. So definitely do that. Of course, have live chat on your website. We recommend Tidio, which integrates with Facebook Messenger, so an all-in-one solution for visitors to have interactions with you. And if you're thinking, "Ah, I'm not going to be at the computer all day to manage live chats." Don't worry, they have iPhone apps and Android apps too, so you can answer regardless of where you are. And finally, one thing we talked about was social proof and how important that is to have on your website. So not only collecting reviews, but displaying them on your product pages. Again, that's just a few of the things that we do with all of our Drop Ship Lifestyle stores, and again, DropShipLifestyle.com/webinar, if you're not part of Drop Ship Lifestyle yet. DropShipLifestyle.com/webinar is where to go to get my free training. But all of these things, when you do them on your store, not only are you putting in the work and learning the skills to make the money from that business, but again, you're building something that's going to provide you with knowledge that you can use in the future, whether that's with another drop shipping store, whether that's with an Amazon store, an info business, a coaching business, consulting, whatever it is, these skillsets are definitely transferrable, and why not get a start while you actually make money? Why not get paid as you learn while also building a real asset, which is your drop shipping store, that you can then sell if you should ever choose to? So I hope you found that valuable. Again, I thought it was interesting that it came up in this conversation. I haven't spoke to Riley since our Chiang Mai in five years, so really cool hearing about his journey since then as well as a whole bunch of other Drop Ship Lifestyle members, and again, once his podcast goes live, I will link to it below this podcast over on ECommerceLifestyle.com so you can check it out. As always, hope you got value. If you did, please do leave a review in iTunes, I would really appreciate that, it should take you 20 seconds and it would mean a lot to me, so thanks in advance, and I will talk to you all in the next episode of The E-Commerce Lifestyle Podcast. See you, everybody. What do you think? Is dropshipping the perfect business model for new online entrepreneurs? Yes, it might just be what I’m searching for.. very interesting. After a few failed online businesses, I’ve concluded that the #1 skill you *must* have is the ability to market/sell. Once you have that down, the whole world opens up to you. 100%! Whether you’re selling yourself to suppliers or products to customers, that’s what drives the business forward!